I actually think that a 0.5 mm dermastamp is a good choice in this case and you do not need the single needle. How many times have you stamped? You can stamp twice a week. If the scar is not improving after several months, add the suction method. The suction method is worth trying. In general, only the rolling type of acne scars is tethered to the underlying structures but it has never been thoroughly investigated and it is very well possible that all indented scars are tethered to the underlying structures to certain extent. The main reason for indentation is missing tissue/skin atrophy (this will be improved by microneedling). Dermarolling / Microneedling / Re: how much to use on face Retin A? To be honest, I do not know how this is possible. Normally, the more you apply, the more redness and irritation it causes. Initially, the reaction to Tretinoin can be quite strong but gradually, the skin will get used to Tretinoin. I cannot comment on your experience because I have no explanation. It would be interesting to hear from other users of Tretinoin. If possible, do not mix vit. A and hyaluronic acid serums together. You do not need a dermastamp, continue using your single needle. I think your skin texture improved a little but it may be due to the lighting of the second photo. It is hard to say. In case of stubborn scars that do not respond, add a 2 mm dermastamp to your dermarolling sessions. You can stamp and roll in one session (treat one cheek, when it heals, do the other etc). I agree that the suction method is worth trying. In general, only the rolling type of acne scars is tethered to the underlying structures but it has never been thoroughly investigated and it is very well possible that all scars are tethered to the underlying structures to certain extent. The main reason for indentation is missing tissue/skin atrophy (this will be improved by microneedling). Yes, you can stamp your scars as soon as the microdermabrasion is healed, which usually takes a day. You do not have to apply an antibacterial cream but do not forget to clean the microneedling tool after it has been used. Disinfecting the dermaneedling instrument after dermarolling is more important than disinfecting the skin before dermarolling. The most important part of the disinfection is to clean the dermarolling instrument after dermarolling with dishwashing detergent and warm water and to rinse it under a strong stream of water to remove blood and skin debris from the needles. Then soak it in Chloramine-T or Ethanol. Retin A improves stretch marks but it makes the skin dry and the needled area must be kept as moisturized as possible after needling. You can apply for example a little almond oil on over the Retin A. Do not needle extensive areas in one session. Needle one area and when it heals, needle another one and so on. But they performed the suctioning shortly after the subcision and subcision is a very aggressive procedure that takes many days to heal. I do not think it is necessary to produce bruises for the suctioning method to work (to release the fibers that tether the scar). Dermarolling / Microneedling / Re: Can I apply A-Ret over a large area? Yes, you can cover the whole area but do not roll really extensive areas in one session. It is always better to roll densely and thoroughly only one area and when it heals, roll another area and so on. Do not apply Tretinoin if pregnant, planning pregnancy or breastfeeding. Dermarolling temporarily increases blood flow to the area, which is for example very beneficial for scars (stretch marks are also scars). Scars have almost no metabolic activity (no blood in them) and dermarolling not only brings blood to the scar, it often triggers revascularisation of the scar, which improves its appearance. It is possible that your hair follicles are unfortunately improving too. but they will go back to normal when you stop rolling. One of our customers reported the growth of fine, fair facial hairs after dermarolling but she was pregnant at the time and changes in facial hair or hair elsewhere during pregnancy are very common. I have not heard from her since her last email. Dermarolling is a relatively new method and it is not yet fully medically understood. 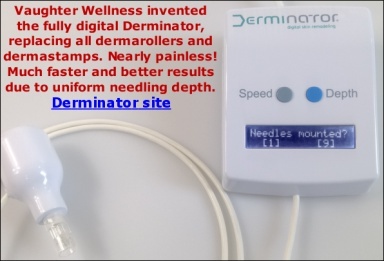 Dermarolling brings more blood to the hair follicles and that is certainly beneficial and there may be some other positive effects on the hair follicles by dermarolling but at the moment, there is not enough data to claim with certainty that dermarolling by itself will promote hair growth. It is worth trying but there is no guarantee. That is why we have been recommending using a 0.2 or a 0.5 mm regular dermaroller to enhance the penetration of Minoxidil. Minoxidil does not trigger new hair follicles - it just prolongs the growing phase of the existing ones and thus makes the hair appear thicker. It does not work for everybody but in many cases it works. The skin "microchannels" caused by dermarolling are relatively quickly closed. None of our customers has ever reported an infection, neither does one hear about dermarolling infections online much, if at all, in spite ofthe fact that tens of thousands of people are dermarolling. Just we alone have tens of thousands of customers. Actually, we have one customer who has reported something that could have perhaps been a mild infection. She needled acne scars on both of her cheeks that had some residual acne spots. One of her cheeks became quite red a day after needling and some of the acne spots became purulent. The other cheek was fine. The problem quickly subsided and everything was OK. It was not her first needling session. It is difficult to say whether it was an infection or the residual acne just flared as a reaction to dermarolling. Always clean the dermaneedling instrument after dermarolling with dishwashing detergent and warm water and rinse it under a strong stream of water to remove blood and skin debris from the needles. Dermarolling / Microneedling / Re: When will your 0.5 and 1 mm dermastamps be available? They have been avaiolable for the past week under "Owndoc dermarollers", but I see we forgot to also add them under "dermaneedling". Stamp randomly on the same scar. Yes, for pitted scars you can use a dermastamp only. If you have for example post acne pigmentation or other skin tone issues or if the overall surface of your skin is uneven, using for example a 0.5 mm dermaroller is recommended. Eight times is a general recommendation that can be slightly modified, depending how your skin reacts. You should always start slowly. If it heals OK, you can slightly increase the intensity when you stamp next time but it should not be overdone either. Do not completely mash the skin. You should stamp more intense if he scar contains hardened collagen fibers, which is often the case with stretch marks or surgical scars. Obviously, be always more careful on the face than on the skin elsewhere. Thank you very much, Cesamaddictaol, for your photos! We have received lots of feedback about the successful improvement of acne scars with our products but nobody sent us any before-and-after photos of acne scars (mainly due to the fact that almost nobody takes the "before" photos). So you are the first. Our customers did send us photos and you can see them on our website but none of them concerned acne scars. "Please remember to give us your feedback on your results. We get many emails from customers saying that dermarolling/dermastamping/needling improved their acne scars, usually after at least a year of monthly rolling sessions. Unfortunately, nobody sent us any before and after photos as of yet. About a year ago I told my husband that one day I would like to needle acne scars (he has just a few) on his forehead and photo-document the process of improvement. He faintly nodded (to get rid of me). Some days ago I took the single needle and tried to catch my husband who saw the needle and promptly ran away. He said: "no way I am going to go through such an ordeal just because you need a photo. Find yourself another victim". Sigh." BTW haven’t you posted your photos also in the subcision-suction thread? We have recently moved our forum and the forum postings that were posted exactly at that time did not appear in the new forum. Sorry about that - Your old login may now work better, we changed something just now to try to fix it. I do not think it is a good idea to apply the A-Ret to your whole face right after dermarolling. A-Ret (Retinoic acid) is basically a mild acid peel and it can irritate and dry the skin. You should start applying it as an experiment to just several of your scars right after dermarolling. Yes, rolling with a 0.5 mm dermaroller in between your 2 mm roller sessions is perfectly OK and it is a good idea. The shelf life of vit. C crystals is three years but in reality they will keep even longer. Vit. C becomes unstable in a watery solution and that is why the vit. C serum has to be made fresh frequently, whereas the crystals themselves are stable. You should keep them cool, dry, dark, and in a closed container (close the ziplock bag).